It's a bit of a myth that all Bengali men love fish. I hated fish while growing up. Specially since I had to eat it every day. Usually it was the same fish and the same preparation. The Sunday chicken curry, on the other hand, was something that I would look forward to all week. It was only after coming to Mumbai that I began to miss fish when I didn't get it as easily here. I am talking of the fresh water fish that Bengalis eat of course. There were enough local Malvani joints like Saayba in Bandra and Mangalorean places such as Apoorva and Mahesh in Fort where one would get seawater fish. That's when I would crave for the fresh water fish preparations that I had grown up on in Kolkata. I would go to the mess on top of the terrace of Hotel New Bengal (now shut), near VT station, for a fish thali even if it had the small and bony rui that I despised while growing up. Then I married a Parsi who loves fish. I would enjoy shopping for fish and cooking it for her. With time I began to eat it too. Specially with doctors advising me to do so as I grew older. Must say that my heart is in meat though and I would any day prefer meat over fish. Still, I broke into a smile when I had rui kalia for dinner a couple of nights back and the remaining curry for lunch yesterday. You can find my recipe for rui curry in this link. Mumbai made me love fish in a way Kolkata never could. I was reminded of the Bengali man's ennui when it comes to fish thanks to my mesho (uncle) and cousin who are staying with us right now. When I asked them what they would like to eat, my cousin said "anything as long as it is mutton or chicken". My uncle said "I can eat eggs for all meals. And potatoes""
Then they both said in unison, "no fish for us please". Which is why I thought of the omelette curry while wondering what to organise for dinner for them the other night when K and I planned to eat fish. The curry was based on something my mother used to do while we were growing up. She would buy a whole chicken from the market on Friday evenings. This became my duty when I went to high school. We moved onto chicken from mutton in the mid 80s itself when my mom read that it was better for one's health. We went to the Bansdroni market in Kolkata to buy chicken. The chicken seller would weigh a live chicken which he would take out of the cage. The chicken would flap its wings and jump on the scales when trussed up and weighed. Once we found a chicken we agreed on, the chicken seller would slit the chicken's throat (right in front of one), wait for it to stop convulsing, pluck its feathers and cut into pieces for you. Sounds pretty grim but was actually pretty assembly line like when one went through this every week. I had written about the Bansdroni market and put up pics which you can see at the link here. Anyway, my mom would cook the chicken on Friday night and it was meant to serve the three of us for three meals...Friday night, Saturday night and Sunday lunch. Now obviously that was not enough chicken for three meals. So, to bulk it up, she unwittingly did with the khansamas of Wajid Ali Shah did to make the biryani last when he was exiled to Kolkata from Lucknow. She added potatoes to the chicken curry. That was still not enough so on Saturday she would sometimes make omelettes and half them and then add them to the curry. Sometimes, for 'variety' she would make Jolly's curry. She told me that this was named after a friend's wife from their time in the UK. The lady, Jolly, would apparently often crack an egg into a curry which was being cooked. The egg would form a ball in the curry. This apparently became pretty popular among their friend's circle and the preparation was known as 'Jolly's curry'. Sundays were special as that's the day we get to eat the chicken. My mom, brother and I would share the drumsticks on alternate Sundays. A far cry from our life in Mumbai now when we buy pre-cut chicken drumsticks when we want to eat chicken. This was not the end of the life of the chicken curry. I would use the liver from the curry to make sandwiches to take to school and then college on Monday. If you want my chicken curry recipe you will find it here. Now, coming back to the omelette (called mamlet in Bengali) curry which we made for our visitors, this time it was a standalone curry and not an addition to chicken curry. The base was the same though. Add omelettes. let the water boil for a minute. Reduce the flame of the the gas. Let the curry simmer for 3,4 minutes and then shut the gas. My uncle prefers to have this with the rotis our cook, Banu makes, while my cousin has all jhols (curries) with rice. 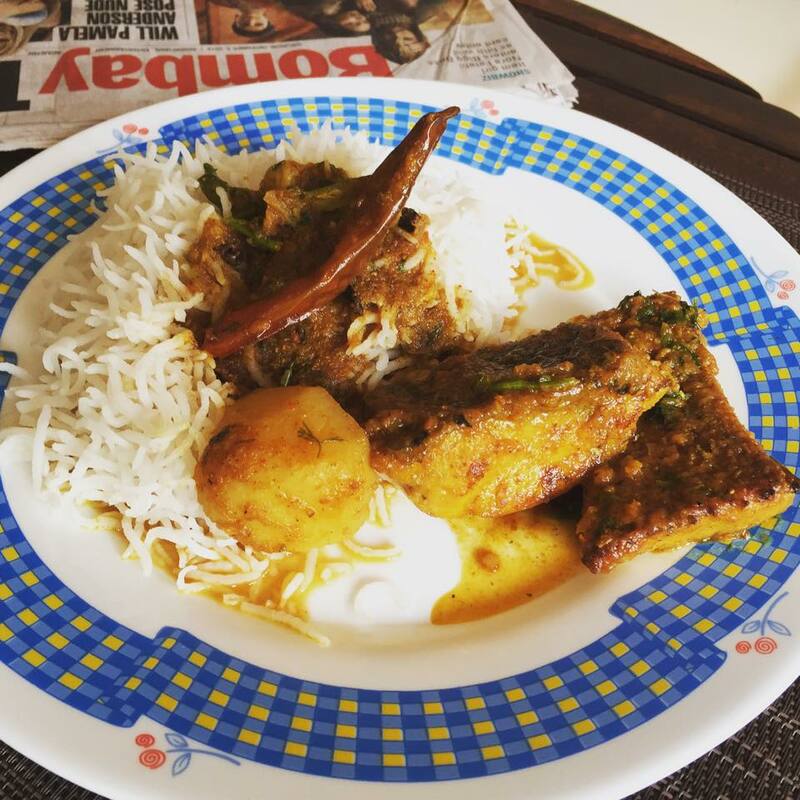 Kaustav Ghoshal Kalyan- you should come up with a book on Bengali cuisine. Some of the recipes that you've given e.g. 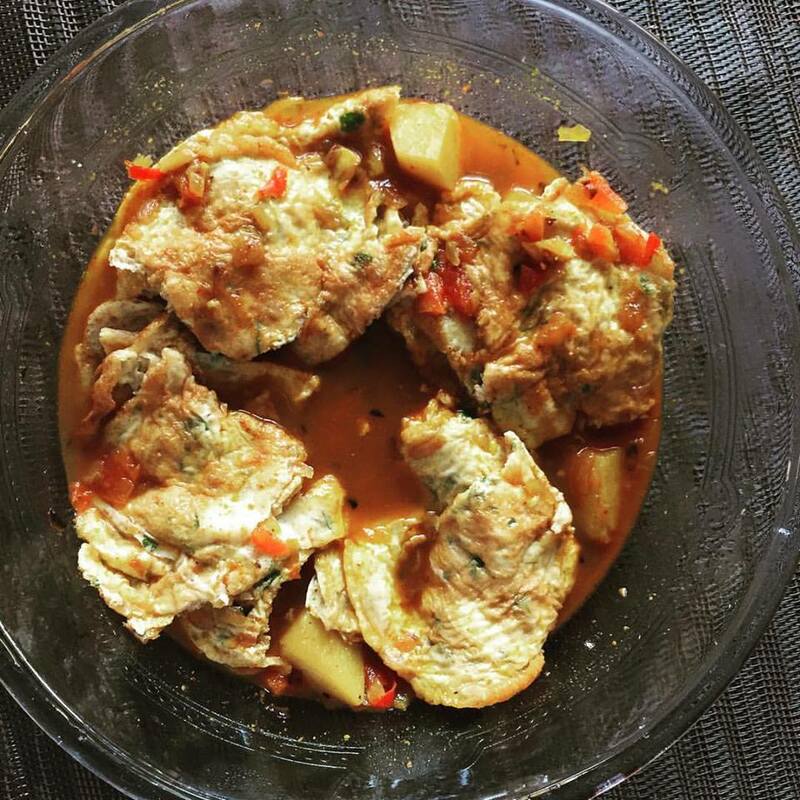 Dimer jhol, omelette 'er jhol are so common, yet your presentation makes them so special. Looking forward to more such recipes ! Ritaban Basu I do a healthy option of the same by making the omelets with egg whites...another dimer jhol is when you break the egg into the jhol itself and so it's like a poached but hard boiled kind of egg in the jhol...have you tried it? Tuli Kar I loved #mamleterjhol! One of my all time favourites and especially with potatoes cut in cubes! Mallika Biswas My mom makes this and she adds cholar dal to this...tastes yum..do try it sometime.. There's something in your writing that makes one almost pine for the days gone-by.... this is so much more than a recipe.